Carlo Biado comes up with a solid performance in the final match. CARLO Biado bagged the Philippines’ first-ever gold medal in the World Games, winning the men's 9-ball gold in Wroclaw, Poland on Saturday. Biado beat World Pool Association No. 2 Jayson Shaw of Great Britain, 11-7, in the event for non-Olympic sports. Dennis Orcollo bagged a bronze in the World Games 2014. Biado, at No. 9 the top Filipino pool player in the world rankings, beat Oi Naoyuki of Japan, 11-7, in the semifinals to arrange a gold-medal tussle with Shaw, who beat Taiwan's Ko Pin Yi, 11-6, in the other bracket. Chezka Centeno missed out on a medal when she lost to China's Han Yu, 9-3 in the women’s side. She lost to Chen Siming of China, 9-6, in the semifinals that would have given her an outright silver. 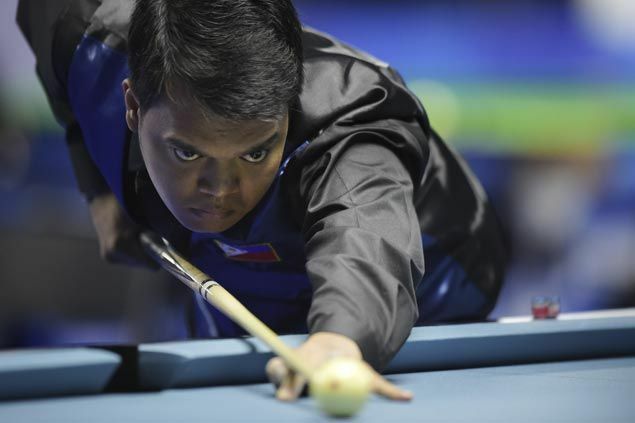 Biado will play in the men’s 9-ball pool singles in the Southeast Asian Games next month in Kuala Lumpur, while Centeno will play in the women's 9-ball singles. Biado edged Joshua Filler of Germany, 11-5, and clinched a semifinal berth after beating Mieszo Fortunski of Poland, 11-9, in the round-of-8.